So you’ve heard all kinds of things about wood boilers, but… Boiling wood? How does that even work? And what’s all this about indoor versus outdoor, gasification and non-gasification? When did warming your home get to be so complicated? It’s not, and Obadiah’s is here to help you understand with a few wood boiler basics. Despite all those fancy terms, heating with a wood boiler is actually fairly simple. 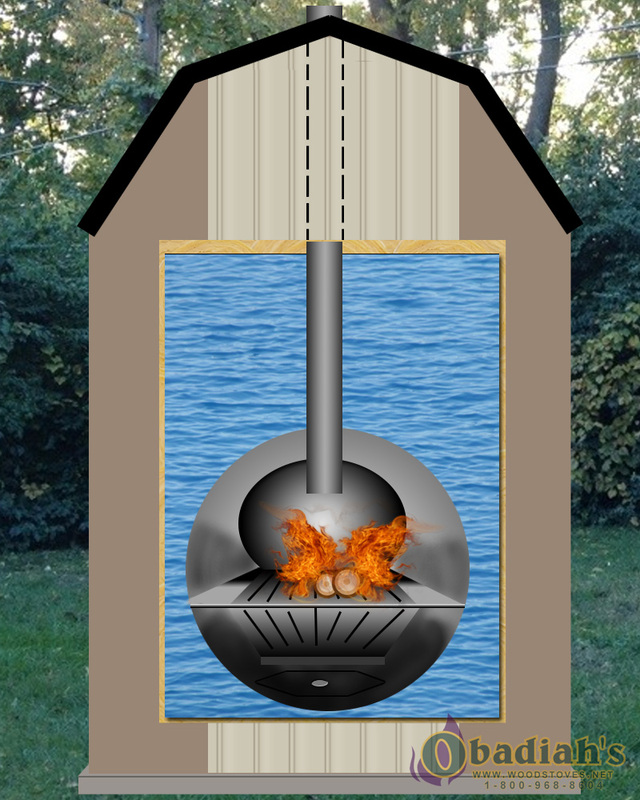 The basic idea is this: You have a firebox like that of a woodstove, sitting inside a steel box. That steel box contains water, which surrounds the firebox. You add wood fuel inside the firebox, light it, and the resulting fire heats the water surrounding the firebox (through the use of a heat exchanger). This heated water is then pumped through a line in your home that eventually loops back to the boiler. Along the way, another heat exchanger inside your home converts the heat from your boiler’s water into whatever you need for heat. For example, if you have ductwork for forced air, a wood boiler hooks right into that via a heat exchanger, which is easily installed in your home. And that’s it! That’s all there is to wood boiler heating. How is this better than any other method of heating? By storing heat energy in the form of thousands of gallons of water, you will only need to fire your boiler for a few hours. After that, the water will retain all the heat your home will need. Many boilers strive for a “twice a day” firing, meaning, you’ll likely need to load it twice a day in the coldest of temperatures. This takes significantly less time in the day to manage than the typical woodstove, and requires less energy than many other forms of heat. Wood boilers also consistently make the maximum use of your wood, leaving very few ashes, which translates to far less money spent on fuel. Boilers can be a big investment, but they will pay for themselves much faster than most forms of heat. Sound good? We think so. However, it’s important to understand a few more things. 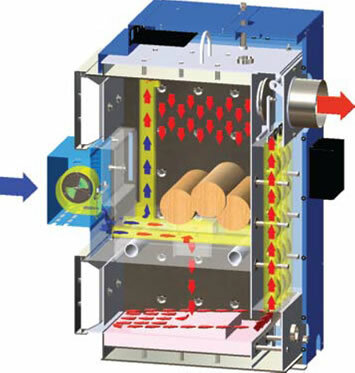 Diagram of an open heating system with a wood boiler. 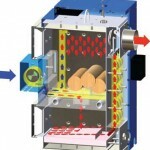 How gasification works in an Econoburn Boiler. That part about “making the maximum use of your wood” is very important when it comes to wood heat. If you’ve ever run a woodstove, you know that burning at less-than-ideal temperatures means creosote: A foul substance that happens when smoke doesn’t heat above 250 degrees F. It can coat the insides of a chimney, leading to dangerous chimney fires and constant cleaning. You don’t want creosote. When you burn wood, you want it to burn hot. A gasification boiler does just that. While wood burns in the firebox, air from outside the boiler is blown downward into that fuel, creating a mixture of hot air and wood gases, which are then directed to a jet of heated air that combusts all of the gases. More heat is generated by this process, and without any leftover gas, you have less risk of creosote build up. A non-gasification boiler, however, does none of this. We go over some of the problems with non-gasification boilers here, but suffice it to say, a boiler that does not make use of gasification will not get as hot. Unless you have access to excellent fuel (well seasoned wood) and live in an area without high emission standards, we don’t recommend them. So where do you put this thing? The answer to that varies with every home, and Obadiah’s is happy to help you figure out what sort of wood boiler will work best for you. In general, the deciding factors are how much room do you have inside, what are the local regulations for outdoor wood boilers, and whether you prefer to keep your wood outside or don’t mind the potential mess it can create inside. When you’re at the stage of deciding whether you want an indoor or outdoor boiler, check out our more in-depth comparison here. The WoodMaster 4400 and the Econoburn EBW-500. Now that you understand wood boilers, it’s time to find out what the best brand is for you. Have a look at the boilers featured on this site, and if you have any questions, don’t hesitate to contact Obadiah’s. We’re always here to help!